Well, this officially exhausts my root beer reserves. I don't have anymore bottles in my fridge to try, so the hunt begins again. Maybe not for a while though. I am technically homeless for the time being, so perhaps when we re-establish ourselves in the greater Phoenix area i will look at ordering some more root beers. Mt. Angel Root Beer is brewed by Mt. Angel Brewing Company in Mt. Angel, OR. According to the website, they won the silver medal in the 2012 National Open Root Beer Competition. The gold no doubt went to IBC. Trust me on this one, you don't need to look it up. The company was founded by two brothers who love brewing old fashioned sodas. They have 4 flavors they currently brew in their modest set up; root beer, marionberry (whatever that is), hazelnut, and orange cream. This seems like a sideline/passion project for these two brothers, but it might be their main source of income. I doubt it though. The website is a bit amateur and doesn't contain a ton of info. I was able to procure this root beer in a 12 oz dark glass bottle from one of my regular websites that i visit for finding single bottles for sale. However, i probably bought this as few as 3 and as many as 5 years ago, because the website says that this root beer is available in 22 oz glass bottles and in several sizes of kegs only, but that 12 oz bottles are no longer available. Don't know how accurate that is but i'll let you do the legwork on that if you care to find out. The label is very simple. It's white and green and has a logo of the Mt. Angel Brewing Company which looks like a family crest completely with a banner with a declaration in Latin. It says "Venite et Gaudete", which according to Google translate means "Vineyards and Rejoice". So... yeah. There you have it i guess. I like this soda. I'm sad i sat on it for so long. It's sweetened with pure cane sugar and has a subtle wintergreen flavor, which i am a big fan of (or for you grammar geeks out there, of which i am a big fan). In fact, the entire flavor of the root beer is very subtle. It's almost like it comes on weak when you drink it as fades in with the aftertaste. Kinda weird, but good. Not amazing, but for what it's worth my wife approved of it too. From the way the website tells it, this stuff is some award winning refreshment best accompanied by some vanilla ice cream for root beer floats. Might be worth looking into, but also expensive cuz they tend to favor selling this stuff by the keg rather than small volumes. Decent stuff though. My official review is Mt. Angel Root Beer gets 6 (six) IBCs. I don't give half ratings, but i would be willing give this an unofficial rating of 6.5 because i appreciate the effort these guys put in. Not quite at the level of a 7, but it's good. Mt. Angel sounds like a beautiful area too. Maybe if i ever get up to Oregon i will check it out. Well... there's nothing quite like writing a root beer review while lying in bed next to a crib with a screaming toddler that won't go to sleep. This might be brief before i commit premeditated babycide. Barton Springs Root Beer comes from Austin, TX and is named after the fresh water springs located there. I couldn't find a website for the Barton Springs Soda bottling company which brews and bottles a few different flavors of soda, but i did find some pictures online of the springs themselves. Very serene and pretty looking. Ocala, FL, where i lived for the last 3 years, has about a dozen of these little fresh water springs all around. They are fun to visit under the right circumstances. The water is crystal clear and fairly cold year round and there is lots of wildlife and stuff to see. 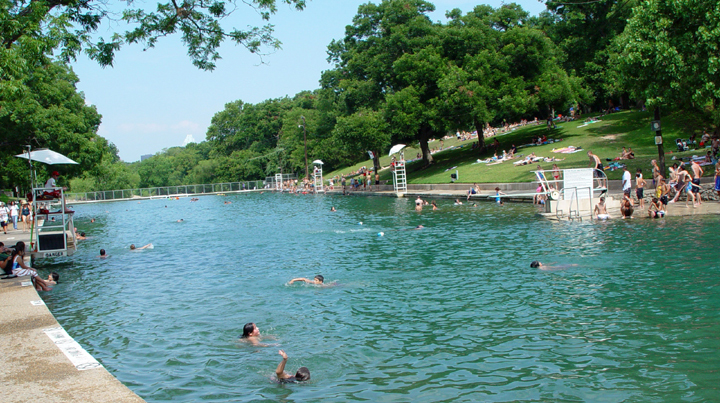 Barton Springs seems like a nice place on a hot day. This root beer came to me in a clear 12 oz glass bottle with a very colorful label. I would say it relies heavily on the pastels and Easter colors. In total it's a very simple design, but the bright colors saves it for the most part. I wish i had more to comment on, but i don't. Plus... this baby isn't making it any easier on me to think of more inane things to say about this label. It's fine. Overall i like it i suppose. Barton Springs Root Beer is sweetened with pure cane sugar, and it shows. It's a very sweet drink, although the flavor is still a touch too watered down for my liking. I get a hint of anise in there, but otherwise it's not very distinctive. In fact, the more i drink it the less i like it. It's average at best, maybe even a little below average. Maybe if you drank one of these things while visiting Barton Springs it would taste better, like how Chinese food tastes better when you eat it using chopsticks. My official review is that Barton Springs Root Beer gets 5 (five) IBCs. Full disclosure, i'm actually writing this after the fact. I drank this in the Tampa airport before boarding the plane that would move me and my family back to Arizona. Plus, we had just eaten at the airport TGIFriday's and it was all very rushed, so i may not be giving this thing a fair shake. But still, it really didn't do it for me, and the only thing i can blame for that is the root beer itself. Now if you'll excuse me, i have a baby to murder. My next post will likely be from prison. This root beer is bottled and distributed by Rocket Fizz as part of their line of root beers and sodas named after celebrities. I don't know much about Gene Autry other than he was a country singer, something i am definitely not an expert about. I don't even possess a remotely reputable opinion about country music in general, not to mention the works of the late Gene Autry. So for that reason, this was simply another root beer on my check list. Not something that got me excited like the Judge Wapner root beer (also by Rocket Fizz). In fact, i know so little about Gene Autry that when i went to the source of all truth to learn a little more about the man, i was surprised to learn that he was really more of a 1940's and 50's television and movie star than a country music star. And i was even MORE surprised to learn he performed several CLASSIC Christmas songs, and even wrote one himself. So it seems like there is a lot more to this guy than i am giving credit. I suppose he deserves his own posthumously awarded root beer. The Label is a simple black and white photo of classic Gene Autry, posing in his cowboy get up with a horse. His name is spelled out in font that resembles lasso rope. It's very simple but very striking. I've come to find out his image is so iconic that it inspired generations of kids to dress up like cowboys, though before doing this review i would not have been able to determine who he was just by looking at a photo of him. The label is fitting for the man. Not really indicative of root beer other than saying the words "root beer" below his name, but i'm not gonna hold that against this one. Oh that this beverage were half as great as the man himself. I don't know much about the guy but have at least a little respect for him now, and it pains me that his legacy is somewhat tarnished by this unappealing root beer. It's really not great. Sweetened with cane sugar, though the base flavors are not easily identified. It's a little spicy, but rather watery and overall just kinda tastes like bad fruit and leave a gross aftertaste. It's a shame that they used this opportunity to further immortalize a music and film legend with a very substandard root beer. My official review is Gene Autry Root Beer gets 4 (four) IBCs. And that's being generous. I thought maybe a 5 based on the merits of the man, but i can't let that slide. I wouldn't recommend this to anyone as a way to quench their thirst. Maybe for the Gene Autry fan and memorabilia collector, but not to anyone looking to enjoy a good solid root beer. Hopefully the root beer they name after me when i die is no where near this terrible. Keeping on the theme of location based root beers (see my last post), this root beer is named for the great city of Chicago, IL. Chicago Root Beer is bottled by Evolution Brands right in Chicago. The company makes and distributes several flavors of soda under the Chicago name. Not sure how long they've been in operation. It looks like they rely mostly on bulk orders with 24 bottles in a case at 60 cases per pallet. If you're interested in becoming a distributer there is some info on the website for you. But if you're like me and just want one bottle to try, you'll probably end up going to The Root Beer Store and getting a bottle for a few dollars plus an exorbitant amount of money for shipping. I'm sure i've mentioned this before, but i've been to Chicago a couple times and rather enjoyed myself. Nice little city. The 12 oz glass bottle is laden with a label that is bland in color scheme but rich in imagery. The iconic Sears Tower (now known as the Willis Tower) is displayed in the dead center, highlighting the fact that Chicago is a hub for architectural study and application of new and old ideas. My wife and i took a boat tour looking at all the different styles and disciplines of architecture displayed in the buildings lining the river. It was neat and enlightening. I'd recommend it. There was another tour on segways along the banks of Lake Michigan, but it was a little more than we wanted to spend. Maybe if we go back i would look into it. One thing i noticed on the label is that my bottle says "fountain classic" below the name and the pictures on the website say "draft style". I am not sure if there are two different styles of root beer they make, but i didn't see any evidence of that on the website. Looks like they probably just updated the label at some point. Anyway, the label is pretty nice. The end. I don't love the taste. It's reminiscent of so many other forgettable root beers. It is sweetened with pure cane sugar and has a hint of carmel taste, but it the flavor fades fast and it leaves a bad taste in your mouth. Dozens of root beers have this same taste and they all fail to impress. For as great a city as Chicago is, this is not their best showing. My official review is that Chicago Root Beer gets 4 (four) IBCs. This one narrowly escaped a 3, but i guess i am just feeling generous tonight or something. It doesn't make me sick, but it's really not very worth while. Please go to Chicago and enjoy the scenery and fun elements of the city, but don't go out of your way to grab one of these root beers. I simply can't recommend it. I don't really know what to call this one. Is it Texas Root Beer? Or Dublin Texas Root Beer? At first glance i would think just Texas, but when i looked on the website it was listed as Dublin Texas. A little confusing right off the bat, i gotta say. If you haven't guessed yet, this is brewed and bottled in Dublin, TX by the Dublin Bottling Works Corporation, a purveyor of several lines of gourmet sodas and beverages. They've apparently been around a while. Since 1891 from all indications. Now... I've heard of Paris, Texas but i never knew there was a Dublin, Texas. I also know there is a London, Ontario, Canada. And of course, there is Ontario, California as well as Rome, Georgia. Then you've got Berlin, Georgia and Berlin, New Jersey and Berlin, Maryland, so that can get confusing. But to top it off, you've got Bagdad, Arizona (slightly different spelling, but basically the same landscape). So i guess what i'm trying to get at is... why isn't there another Tokyo other than in Japan? Right? Come on people, we are a progressive society. Why can't we get this thing going? Dublin Bottling Works specializes in bottled sodas, so it's no surprise this comes in a 12 oz glass bottle with a colorful label and matching cap. The confusion on the name is apparent from the label. Texas is proudly and boldly displayed in large font, while the "Dublin" part kinda lingers near the top of the label. There is also a Bart Simpson kinda looking dude pictured as part of the Dublin Bottling Works logo. Other than that, it's a pretty straight forward package. I don't disapprove of it. This root beer is well carbonated, which i like, and flavored with pure cane sugar. It has a nice aroma when you crack the cap. Nothing on the ingredients list gives and indication as to what it might taste like, which is why i am having a bit of a hard time putting it into words. It's just basic root beer i guess. No frills to it, but it also doesn't wow me. I've got no squabble with it. I mean, i'm not lookin to mess with Texas. But for as big and bold as it declares itself to be, i just wish it had a little more to back itself up. My wife doesn't think it even tastes like root beer, but that's cuz she just hates Texas and everyone who lives there. In fact, if you live in Texas, my wife wants to fight you. Or if you're dead and buried in Texas, she wants to spit on your grave. And if you are thinking of moving to Texas from any other state, she wants to find your moving truck and cut the brake lines and slide a couple unpinned grenades behind the driver's seat. And if you brew and bottle a root beer and brand it with Texas anywhere in the name and distribute it nationwide for thirsty patrons to seek out for refreshment in times of necessity, well... she's gonna say it doesn't taste like root beer. Might be a bit of an unmeasured response, but i can't control how this crazy broad is gonna react. My official review is that Dublin Texas Root Beer gets 5 (five) IBCs. It's just gotta get a 5. Nothin bad about it but also nothin great about it. I wouldn't be able to distinguish this in a line up, something i've said of several other 5's in the root beer world. But i could easily pound a few of these and be satisfied. Give it a shot if you're in Dublin, TX. But if you find yourself in Moscow, Idaho you're just gonna have to figure something out. Well hello there. In case you were wondering (or hoping), i'm not dead. Quite the contrary, my life has been so crazy and hectic that i haven't had the opportunity or even really the desire to keep up on my root beer blogging. But i figure i need to at least go through the stash in my fridge since i and my family will be moving back to Arizona next week. Yes, we have had our fill of Florida living and decided that being closer to family for my wife's sake is the best thing for us right now. As a result, i am going to shot gun out a few reviews these next couple days to get rid of the bottles of root beer i still have in my fridge (maybe 6 total). So let's get into it, shall we? This root beer is one i found at our local Aldi grocery store, which distributes this root beer out of Illinois. I think i have actually already reviewed this root beer in a 12 oz can, the difference being that this is Summit Vintage Root Beer and that is called Sudz Root Beer, brewed by Summit. I had to go back and read my review of that so i could remember what it was all about before getting into this one. I can't be certain they are the same thing, but we will discuss that in a bit. As we all know, i prefer root beer from dark brown glass bottles, so this one is on point. If you couldn't tell from the name (which is a dead give away), the label is a throwback to the old ways of doing soda pop. It has an old time soda fountain shop look to it, though it still wreaks of being a generic soda. This came in a four pack of bottles in a card board case, not unlike IBC, which matches the label on the root beer bottle. In the end, the label is fine. It caught my eye when i passed it, which is the point of advertising, so i guess you could call it successful. I would like to drink a can of Sudz while drinking a bottle of Vintage to see if there are any subtle differences. Part of the vintage, throwback soda trends is to sweeten with cane sugar. The box says it is sweetened with sugar, but doesn't specify cane sugar so maybe it's just processed sugar. The box also says it has a creamy blend of honey, vanilla and licorice. Honey is a no on the taste. Maybe a hint of vanilla and probably the same for a weak anise finish, but it's somewhat watery. Not overly so, but the taste is a little flat. Decent carbonation though, and in the end it's not terrible. My official review is that Summit Vintage Root Beer gets 6 (six) IBCs. I think this is what i gave Sudz as well. Again, it would be interesting to do a side-by-side comparison of these two root beers to see how similar (or dissimilar) they are. I doubt i will find these in Arizona though since they don't have Aldi out there. If one of you wants to do the comparison and post your findings in the comments, i won't care or acknowledge them at all. After all, i'm the expert here. But go ahead, maybe some of these other dummies can benefit from your inferior opinions.